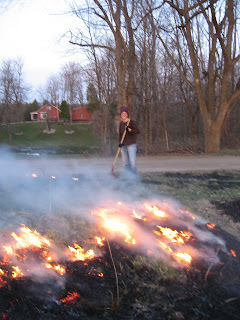 We burned the yard again this evening, much to the disapointment of our neighbors, I'm sure. The daffodils and iris weren't too happy either, but overall it's a great experiment. We don't mow a large portion of the yard - a waste of fuel, time, and money - but just have trails that run through it. The burn ran mostly along the top of the grass, and we're already seeing more green than black. I'm also not seeing the dreaded garlic mustard over there despite its presence along our fence lines. I've got my fingers crossed that we can continue to keep it out and encourage whatever natives come along.